I haven’t been blogging much lately, but am happy to say that school is back in session as of today and I received a shipment from SU! on Friday (timed that just right). I am now focusing on some contest categories in the latest Stampin’ Success…since I haven’t submitted since my Artisan Entries. Wish I could show you my work in progress, but you know how those rules go!!! Oh the possibilities with all my new stuff. Within the next day or two, I will be focusing on creating a blog roll so you can take advantage and view some really awesome stamping blog sites. And there are many “must see sites” I would like to share with you. Thanks for stopping by and checking my site. Have a wonderful night. Oh my, where to start with this one. I’m trying to learn to like the Wanted stamp set, and trying to find some creative ways to use it…and I’m having trouble. While browsing some blogs yesterday, I found inspiration on Allison’s blog, Stampin’ when I can… I was looking at her background blog design while waiting for her site to download, and thought, “Now, that’s a cute design.” You can also find really cool stuff on her site. Chocolate Chip (and a Transparency Sheet) 5-1/2″ x 11″ folded in half; Groovy Guava mat 5-5/16″ x 5-5/16″; Creamy Caramel 5-3/16″ x 5-3/16″; Close to Cocoa strip 1″ x 5-1/2″. To create the design on the Creamy Caramel CS, you have to locate the center & stamp circle image using Stamp-A-Ma-Jig tool. 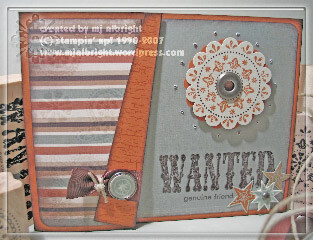 I used Wanted stamp set designs colored with Creamy Caramel, Close to Cocoa and Chocolate Chip Stampin’ Write markers. I measured 1-1/2″ out from the center of the circle and stamped the smaller Chocolate Chip circles. This process continues to cover the whole piece. The Larger circles are 2-1/8″ apart from one another. I used the Stamp-A-Ma-Jig tool for the whole design (this tool is my best friend). I pierced the cardstock between designs (comes out to 2-1/8″ boxes). I created faux-stitching with a Chocolate Chip Stampin’ Write Marker. Added some small white dots with a White Uniball Signo gel pen. Sponged edges with Chocolate Chip ink. I punched out a half-circle to bottom right corner of card using a slit punch. It’s all smooth sailing from this point on! This card is covered with a Transparency Sheet. 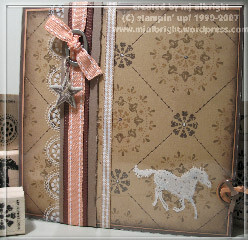 I stamped the horse to the bottom right corner using Stazon White ink. The stamped white scalloping to the left of the ribbon is actually the paisley stamp from the Wanted stamp set. The cardstock and ribbon covers up the tails of the paisleys leaving only the scallops. I used Stamp-A-Ma-Jig tool to align this design. They start 7/8″ in from the left side of the card. The ribbons actually anchor the transparency sheet in place so I don’t have any adhesives showing on front or back of card. I adhered the 1″ x 5-1/2″ strip of Close to Cocoa cardstock over the paisleys. Added Chocolate Chip 5/8″ Grosgrain ribbon. 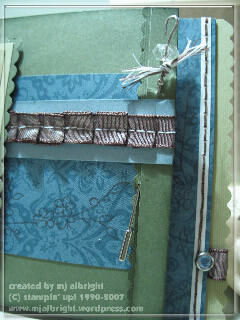 Layered Groovy Guava double-stitched ribbon and tied in place with hardware from Hodgepodge Hardware-Pewter. 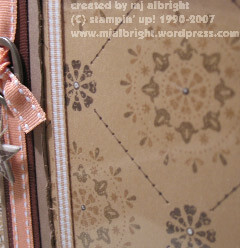 Stamped star image, with Chocolate Chip ink, on a star chipboard piece from On Board Blossoms & Basics, punched hole, attached to hardware piece with Linen Thread. 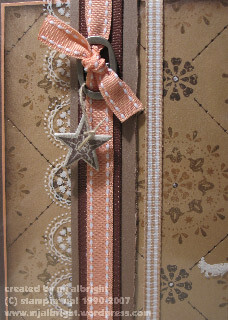 Added a strip of Caramel Gingham ribbon. Added a circle/spiral from Hodgepodge Hardware-Pewter and created faux-ribbons from thin strips of Groovy Guava and Close to Cocoa cardstock. Usually my 3 year old son is my official stamp cleaner. I let him play around today while I was making this card. He’s just so much fun. If you know me, you know that vintage is so not my specialty. When I started tonight, this was not what I had in mind. My cards are mostly bright and almost always include watercoloring. This was truly a challenge for me that took longer than planned. This card was made for Beate’s WSC #14. Used Always Artichoke CS measuring 4 1/4″ x 11″ scored at 5 1/2″ & 10 1/2″. Stamped the little 1/2″ fold with my Linen BG stamp and Always Artichoke ink. Scalloped edge using Fiskar scissors. Adhered a small strip of plain Always Artichoke CS measuring 3/4″ x 4 1/4″ over the flap. Adhere a piece of Blue Bayou Prints DSP measuring 2 1/2″ x 4″ to card front. Stamped flower image from Artfully Asian stamp set using Chocolate Chip ink. Adhered the 1/2″ flap down. Attached hat pin from Pretties Kit (with a clear bead, white & brown threads, and a spacer bead on it) to the flap. Used a piece of Bordering Blue CS measuring 3/4″ x 4″. Attached Chocolate Chip Tafetta ribbon to the piece with sewing machine and white thread. Adhered over piece of Blue Bayou Prints DSP and the small 1/2″ flap. Used River Rock CS measuring 2″ x 3″ stamped with Linen BG stamp and sponged edges with River Rock ink. Matted with a 2 1/4″ x 3 1/4″ piece of River Rock CS and a 2 1/2″ x 3 1/2″ piece of Always Artichoke (scalloped edges). Made 3 stitches to bottom right corner using white thread. Stamped Sentiment from Artfully Asian stamp set using Bordering Blue ink on Confetti White CS. Cut out desired pieces and sponged edges with Bordering Blue ink. Adhered to River Rock piece. Created shadowing to sentiment pieces using River Rock and Chocolate Chip ink blended with an Aqua-Painter. Attached buttons from Fresh Favorites I colored buttons. Pretties Flower created using a circle from On Board Blossoms & Basics covered with Blue Bayou Prints DSP. Middle petals sponged with River Rock ink. Attached to River Rock piece with a blue (ice) rhinestone brad. Added a couple threads of brown thread tied around the brad. Adhere to card using Pop-Up glue dots. I attached a strip of Blue Bayou Prints DSP measuring 2″ x 4 1/4″ to inside of card. A small strip of Confetti White CS measuring 1/4″ x 4 1/4″ over Blue Bayou piece. Stitches made to pieces with brown thread. Attached a small tab created with Chocolate Chip Taffeta ribbon. Attached another blue (ice) rhinestone brad. I adhered a piece of River Rock to the very back of the card (to cover sewing and brad) measuring 4 1/4″ x 5 3/4″ stamped with Linen BG stamp and River Rock ink. Scalloped edge. This little card is so sweet. I used Certainly Celery as card base measuring 4 1/4″ x 8 1/2″ scored at 4 1/4″ to give you a square card. I used Rose Red Prints DSP 1 7/8″ x 3 3/4″ with Basic Black matting 2″ x 3 7/8″. I made a small slit along the left side of this paper to thread my black gingham ribbon through and tied in a knot. 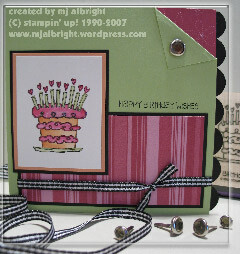 Stamped “happy birthday wishes” with Basic Black. Birthday cake stamped on Shimmery White 1 3/4″ x 2 1/4″ with Stazon Jet black ink and watercolored with aqua-painter, groovy guava, purely pomegranate, and certainly celery classic stampin’ pads. All the fine doodle lines were colored in with certainly celery, rose red, and pumpkin pie stampin’ write markers to coordinating colors. I added iridescent ice to the top layer of the cake (can’t see well in photo). Matted with Groovy Guava 1 7/8″ x 2 3/8″ and Basic Black 2″ x 2 1/2″. I folded down the top upper right corner of the card and attached a green rhinestone brad. I added a small piece of Rose Red Prints DSP. I then added a strip of Basic Black scalloped to right side of card using the Slit punch. Tonight I finally got the opportunity to sit down and take a look at my convention freebies. I just love all the stuff I got and see a lot of potential. This is a Gate-fold card that I created. Stamp sets used: Fun & Fast Notes and Happiness background stamp. 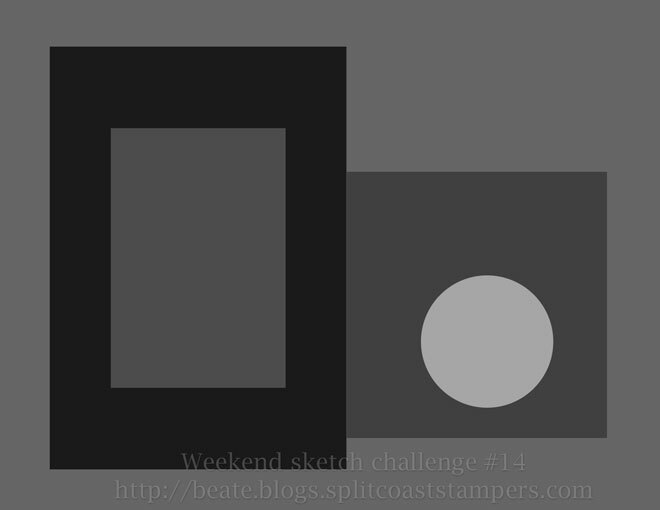 Card base: 3 7/8″ x 8″ Barely Banana cardstock scored at 2″ & 6″. 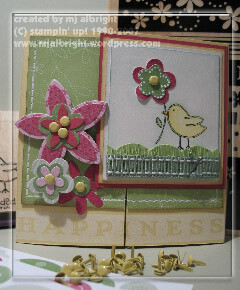 Stamped “happiness” sentiment with Whisper White craft stampin’ pad. Front matting: 3 1/8 ” x 3 3/4″ Certainly Celery Prints DSP with edges pierced and faux-stitched using White uniball signo gel pen. Cut down middle at 1 7/8″ and attached to Barely Banana card base. Front matted square with stamped image: 2 1/2″ x 2 3/4″ Rose Red; 2 3/8″ x 2 5/8″ Barely Banana; 2 1/4″ x 2 1/2″ Shimmery White; 2 1/8″ x 2 3/8″ Shimmery White again (stamped piece). All piece edges were sponged lightly with Creamy Caramel except for top Shimmery White piece which was watercolored with Soft Sky classic stampin’ pad using Aqua Painter. Used Stazon Jet Black & Barely Banana to chick, Cert Celery for stem, and added a small touch of Pumpkin Pie to beak. Colored in the fine doodle-lines with markers of same color. Grass created with strip of Certainly Celery with close cuts made to create grass…I used “retired” small corner rounder to scallop the grass. Added Wild Wasabi dbl-stitched ribbon to base of grass and stapled in place. Flowers are from Build-A-Flower Accents & Elements Kit. Larger flower is adhered to a coordinating chipboard flower from On Board Blossoms & Basics and used Spring Flower Bouquet punch for center. Lighter shade of green flower popped out with 2 stampin’ dimensionals stacked on top of one another so it is raised higher than the chipboard flower. All flowers have brads from Rich Regals. Added small dots to chicks flower to coordinate/flow with the DSP background used. I quickly make this card tonight due to not posting anything lately. I probably won’t be able to post again till later this week…I will be leaving town tomorrow early am for a funeral. This card was made for Beate’s WSC #13. Card base: 4 1/4″ x 8 1/2″ Really Rust scored at 5 1/2″ and folded to create small flap. Inside matting: 4″ x 5 1/4″ Outlaw DSP (Wanted stamped with Chocolate Chip. Used stamp-a-ma-jig tool and stamped again with versamark..applied crystal clear stampin’ emboss powder and heated). Stamped “genuine friend” from Amazing to Zany stamp set. Scallop punched stamped image and a piece of really rust cardstock. 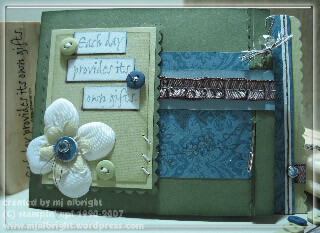 Attached Pewter Jumbo Eyelet and attached to card with stampin’ dimensionals. Used piercing tool to add some details around circled image. Added 3 stars to bottom right corner of card. Used Weathered BG stamp on small folded-over flap using Really Rust ink. Made a slip for 5/8″ Chocolate Chip grosgrain ribbon using hobby blade. Added a build-a-brad to ribbon/flap with a small hemp tie. Sorry if I forgot any details.